It’s Easter Sunday in Coralhood, which is a beneath the sea town. All the sea kids search for eggs at the playground near the church. Among them is Paul, who is autistic. who found two of the three special eggs, to share his eggs with Paul. Just then Pastor Jerry enters the classroom with terrible news – Lenny was hit by a boat propeller! from the treasure chest, but in the spirit of sharing, he is giving it forward. are kids between the ages 6 and 8. The book is an invitation for a conversation between the parent or caretaker and the kids about the holiday. kid is a different sea creature. 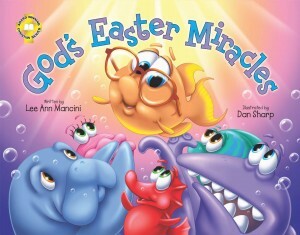 Brian and Lenny are manatees, Jimmy is a sea horse, Miss Linda is a lobster, etc. that’s just an opportunity to discuss marine life and the dangers they face from the hands of mankind. Personally, I prefer subtext to me more subtle, but since I’m Jewish I don’t have the tools to appreciate the religious messages in the story.